Pineapples are the theme for this year’s crochet conference (2016). 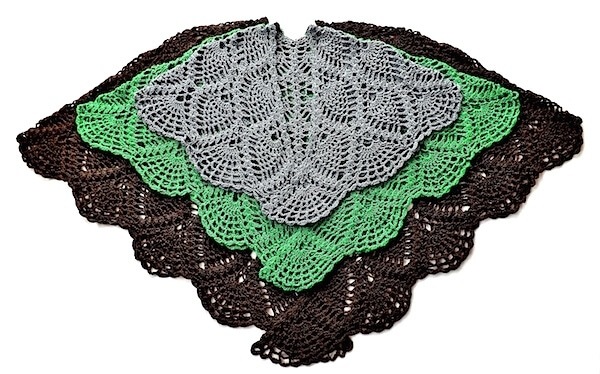 CGOA’s Hall of Fame Award winner happens to be a pineapple lace queen! If you’ll be attending the conference this month, come by our booth #203 (on the right after you enter the market). Lots of pineapple lace to see and try on! Pictured: Three sizes of Curaçao —a wrap with jacket option—in Carbonite (dark grey), Emerald Deep, and Dark Roast colors of Lotus.